Now, more than ever, we commit to support immigrants, refugees, and asylee communities in our state and the organizations working to ensure their well-being and success in Maine. We reject attempts to divide, isolate, or segregate our communities. We affirm that immigrants, refugees, and asylum seekers enrich our community socially, economically, culturally, and politically. 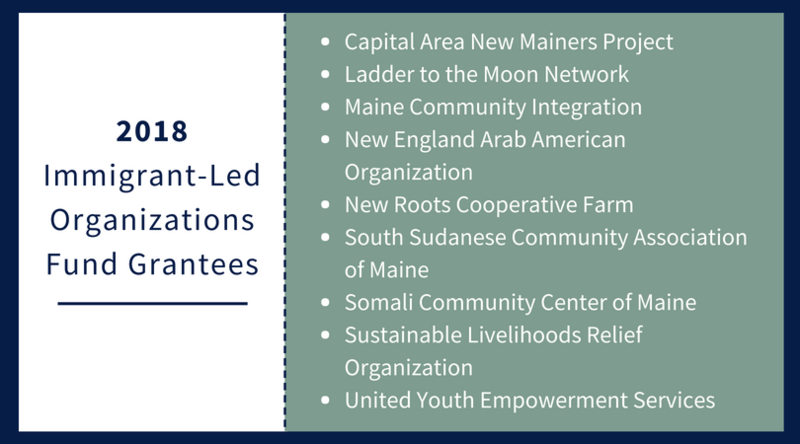 To this end, Maine Initiatives, with the support of the Broad Reach Fund, recently established a new Immigrant-Led Organizations Fund to support immigrant-led organizations doing critical work in our state. These nine organizations present a wide range of immigrant-led organizing and activism that is enriching and improving our communities and our state. We invite you to learn more about these important and impressive organizations and to consider supporting their work directly in solidarity and as an affirmation of our community values. Learn more here. It is only by engaging and expressing our values in the community do we make them real. We hope you will continue to engage with us, in community, as a resource and an ally for our immigrant, refugee and asylum-seeking neighbors!